Hon. ANDRES B. REYES, JR.
Hon. JOSE C. REYES, JR. Under Article VIII, §1, the judicial power shall be vested in one Supreme Court and in such lower courts as may be provided by law. This power includes the duty to settle actual controversies involving rights that are legally demandable and enforceable and to determine if any branch or instrumentality of government has acted with grave abuse of discretion amounting to lack of excess of jurisdiction. 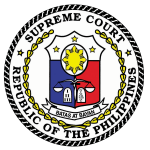 The Supreme Court has administrative supervision over all courts and court personnel. (Article VIII, §6) It exercises this power through the Office of the Court Administrator.